Anthony van Dyck is probably best known for his grand oil portraits of Charles I. 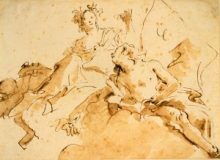 In this watercolour, however, he proves his mastery of other media and subject matters. The trees in the foreground are lush and green and painted with several different types of brush strokes which create texture and movement. Van Dyck’s landscape sketches were often made as a preparatory studies for the backgrounds of his portrait paintings. However, this landscape does not correspond with the background of any of his known portraits. 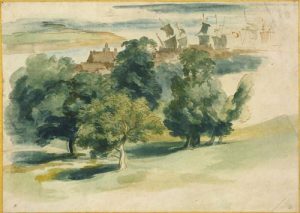 The informality of composition and the rapid execution of this watercolour imply that it could have been made directly from nature, possibly while van Dyck was waiting for fair winds to take him to the continent. Groups welcome – but limited to 12 people at any one time.